Note: I am not against Hostgator, It is just my personal experience. Do remember that they are really great hosting company as well as affiliate provider. How ShareAsale affiliate changed my affiliate marketing carrier in blogging? When I get started in the field of blogging I was just a stupid one who copies someones hard work and paste it as his original content. I don’t know why I was blogging, may be just because I want to show off to my friends or I was really interested in this field. It was just an unanswered question till I made my first figure income from my blog. I can’t believe that I made some bucks just from my home without even going outside of my room. I know that it was not much amount to get excited or to give party but I still remember that I brought a shirt using that income. Gradually, I started making decent earning from my blog and day by day the excitement was increasing rapidly. To monetize my blog I used several techniques like adsense, infolinks, chitika, affiliate marketing and among all of the monetization platform most of my income was coming from affiliate marketing therefore I was focusing a lot in it. Day by day I was applying for several affiliate programs and one day I realized that I have applied for more than 20 affiliates. Then, I started looking back to my browser history and emails to find my affiliate programs. Finally I realized that I should apply for such program where all affiliates are under same website i.e ShareAsale. I have talked about what is affiliate marketing in my previous post affiliate marketing for dummies and here I will be talking about managed affiliate programs that helps you to apply for several programs from single website. ShareASale is an affiliate website having thousands of affiliate merchants in one place. 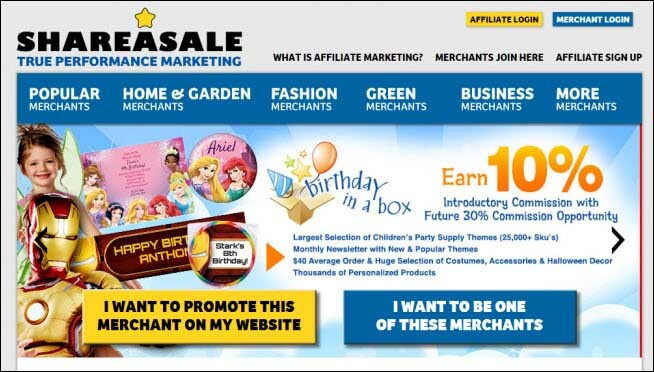 It means that you don’t have to visit each website and sign up their affiliate program each time instead when you create a ShareASale account then you can join thousands of affiliate program with a single click from their merchant store. How ShareAsale increased my online income? Initially when I joined affiliate program I started my affiliate carrier from hostgator but as I was beginner it was very hard for me to make a single sale. Luckily, I made my first sale when hostgator was offering 75% discount in its hosting packages. My first experience with hostgator was very worst because I didn’t receive my commission even after making 2 sales. Hostgator terms and condition states that you should make minimum 2 sales within 6 months to receive your commission otherwise it will be marked as invalid. Actually, I didn’t receive my first commission because I haven’t made my second sale but even after making second sale within few months they never paid me because according to them second sale was made through old customer and the commission is not eligible to get paid. As I was beginner it was very hard for me to make a single sale and those $100 from 2 sales really matters a lot for me. I am not the only one person who is facing such problem famous blogger Harsh Agarawal had written a post regarding this issue. You can read it here. Is HostGator Affiliate Program Flawed? This was my worst experience with Hostgator and later on after making few sales I stopped promoting their products in my website. After this worst experience I decided to be on safe side therefore I applied for ShareAsale to mange my affiliate program and really that was one of my great decision. I can apply thousands of affiliate program from a single dashboard and can view all stats from there. My commission are controlled by shareasale therefore there will be no any limitations and policy restriction of reaching your minimum threshold in given time period. How I was Blessed by ShareAsale? Being a blogger affiliate marketing was one of my main source of income and single penny matters a lot for me because I am making living from it. Sometime many bloggers like me get cheated by affiliate program terms and condition but program like ShareAsale will help us a lot to save us from such situation and I will be explaining them here in this post. As I mentioned above I didn’t receive my first commission from hostgator because I can’t reach minimum threshold within 6 months but program like ShareAsale will never wipe your commission until you reach their minimum threshold criteria i.e. $50. No matter how long it takes to reach threshold criteria you just sit relaxed and try to make as much sale as you can. I am from Nepal and I don’t have a verified paypal account therefore I usually face problem when I try to withdraw my funds. Thankfully I have my relatives in USA and I usually use their paypal account but it is not a perfect solution to withdraw funds therefore I created a virtual bank account in USA using Payoneer and now I can withdraw my funds directly here from Nepal. Since, ShareAsale supports Payoneer you will never face any problem to withdraw your funds. In my early phase of blogging I applied for more than 20 affiliate programs and gradually when the number goes on increasing I was facing problem to manage all those account. Sometime I have to look back to my browser’s history to find affiliate programs that I applied for and sometime I used to forget my username and password. After signing up for ShareAsale I don’t have to worry about remembering all my affiliates companies and login credentials because ShareAsale manages thousands of affiliate program in single marketplace.